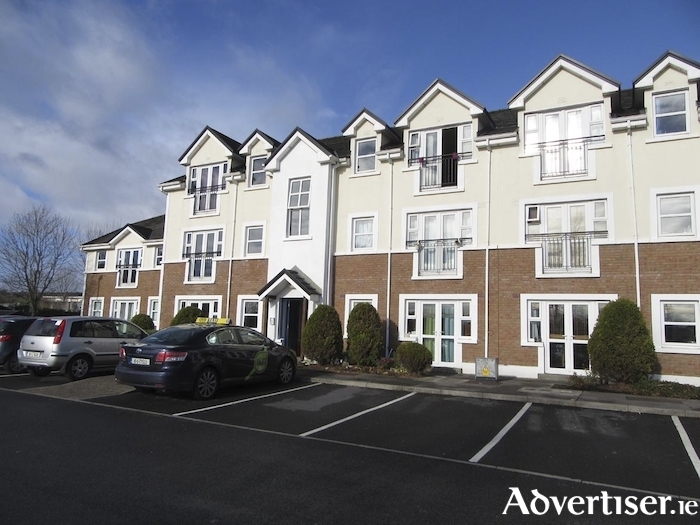 Colleran auctioneers has been favoured with the sale of No 8 An Lochan, a secure second floor spacious three bedroom apartment just off the Headford Road within walking distance of Dunnes Stores, Terryland Shopping Centre and Retail Park, and the Maldron Hotel. As you look out over the stunning view of the countryside from the living room, it is hard to believe you are so close to the city centre, with a bus stop and local Centra just outside. One of the many extras with No 8 An Lochan that sets it apart from other apartments is that it offers a very large undeveloped attic space, providing an abundance of storage space seldom found in apartments. This property is in turnkey condition and is being been sold to include all furnishings and electrical appliances. The bright, spacious, accommodation includes three bedrooms with master bedroom en suite, and an open plan kitchen/living/dining area with a generous range of built-in and overhead kitchen units. The view from the living room must be seen to be appreciated. If you are a first time buyer looking to get your foot on the property ladder or an investor looking for that gilt edge investment, fully furnished and ready to rent, No 8 An Lochan is certainly worth viewing. Open viewing takes place Saturday 2pm to 2.30pm. AMV is €125,000. No 28 will be offered for sale by public auction on Thursday December 6. Also included in Colleran's next auction are No 56 Tara Grove, Wellpark, a four bedroom semi, AMV €260,000, open viewing Saturday 11am to 11.30am; No 18 Emmet Avenue, Mervue, a three bed terraced, AMV €210,000, open viewing Saturday 12 noon to 12.30pm; No 1 Beechwood Park, Ballybane, a four bedroom detached, AMV €265,000, open viewing Saturday 1pm to 1.30pm; and No 11 Ardilaun Road, Newcastle, a three bedroom detached, AMV €280,000, open viewing Saturday 3pm to 3.30pm.